Working Partnerships USA is a community organization that drives the movement for a just economy by bringing together public policy innovation and the power of grassroots organizing. This Sunday is the annual Labor Movement Holiday Party, a safe, free, and uplifting afternoon of holiday activities for thousands of low-income South Bay children and their families. We're excited about this new project with the Chan Zuckerberg Initiative to help address the Bay Area's affordable housing crisis. We'll be working closely with Faith In Action Bay Area/PICO California, East Bay Housing Organizations, and the Non-Profit Housing Association of Northern California to develop shared regional affordable housing solutions. As the tech boom has driven rents sky-high, renting families and seniors in San Jose have actually seen their incomes go down. That's one of the key findings from "Soaring Rents, Falling Wages," our new research brief we released today at City Hall. We revealed that the gap between wages and what it takes to afford an apartment has grown 3 times since 2009. And while tenants are stretched to the breaking point, big landlords and absentee corporations are making millions off our housing crisis. 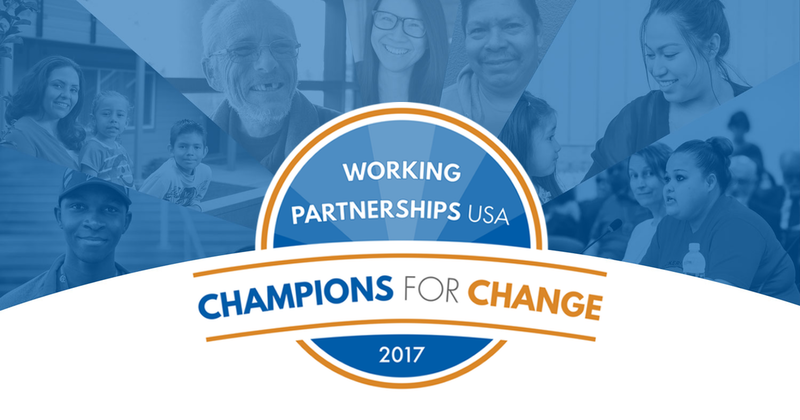 Working Partnerships USA is excited to announce that at this year's Champions for Change, we'll be honoring the Silicon Valley Renters Rights Coalition and three incredible unions at the heart of Silicon Valley Rising! This news and ticket sales - opening today - are on our new event website. Click here to become a sponsor or purchase individual tickets. For questions about sponsorship, contact Aleli Samson at aleli@wpusa.org or 408-809-2139. P.S. Stay tuned - in coming weeks we'll post exciting announcements about our Host Committee and the national leader who will be our Racial Justice Champion. Just Cause wins in San Jose! Last night, thanks to the tireless work of the Renters' Rights coalition and the labor movement to build power for renters and working families, we won Just Cause protections against unjust evictions. Requiring Just Cause for evictions, so landlords can't kick out responsible tenants and hike up rents. Ensuring that landlords provide relocation assistance for tenants if their apartment is taken off the market for repairs or under the Ellis Act, and preserving rent-controlled units. The Council also voted to study using the Consumer Price Index to cap rent increases on rent-controlled apartments. This would lower the ceiling for rent increases from 5% to less than 3% a year. These protections will help 450,000 San Jose renters — our neighbors, children, and co-workers — stay in their homes. But the fight to address Silicon Valley's housing crisis is far from over. We couldn't have won last night without your support, and we'll need your energy and dedication as we keep fighting to keep hard-working families from being priced out of our region. As working families in San Jose struggle with sky-high rents and unjust evictions, the out-of-town corporate landlords who own most of the city's apartments make millions in profits. That's the takeaway from a new research report, Cashing In on Renters, that we released at San Jose City Hall today. We found that a family now needs to earn $113,040 just to afford the average two-bedroom apartment, and that the number of “no cause” evictions has increased by 270 percent in the past five years. 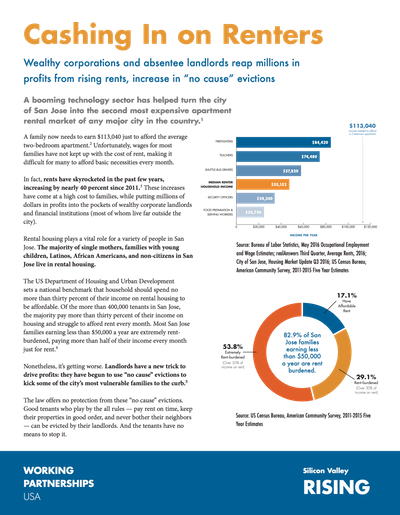 Meanwhile, the average large landlord earns $2.9 million each year from Silicon Valley's extreme rents. Since 2010, over 2,200 households suffered “no cause” evictions, losing the roof over their heads even when they played by all the rules. Data from neighboring San Mateo County showed “no cause” evictions disproportionately target female-headed households, families with children, seniors, low-income households, Latinos, African Americans and Spanish speakers. The Santa Clara City Council has unanimously passed the first worker retention ordinance in Silicon Valley! This new ordinance will provide much-needed job security to some of our most vulnerable workers. This law will protect food and building service workers from mass layoffs when companies switch contractors. It requires that if a company with an office or venue in Santa Clara hires a new contractor or brings services in-house, the workers who currently work at that location must be kept on for a 90-day transition period. At a packed council meeting that stretched from Tuesday evening into Wednesday morning, workers shared moving stories about why this worker retention policy is so important. Maria Guerrero, a cafeteria worker at Intel, described how "Intel has changed food service contractors twice in the last three years, and the first time, workers lost their jobs on the day before Thanksgiving. I worry constantly about losing my job to a contractor change." Today, tech engineers and programmers rallied alongside Silicon Valley Rising's coalition of tech shuttle drivers, janitors, security officers, and food service workers to call on the world's most powerful tech companies to stand with their workers. The Tech Stands Up rally in Palo Alto brought out hundreds of newly energized workers who not only want to see their companies push back on hateful immigration policies from the Trump Administration, but also take action against the tech industry's own scandals. 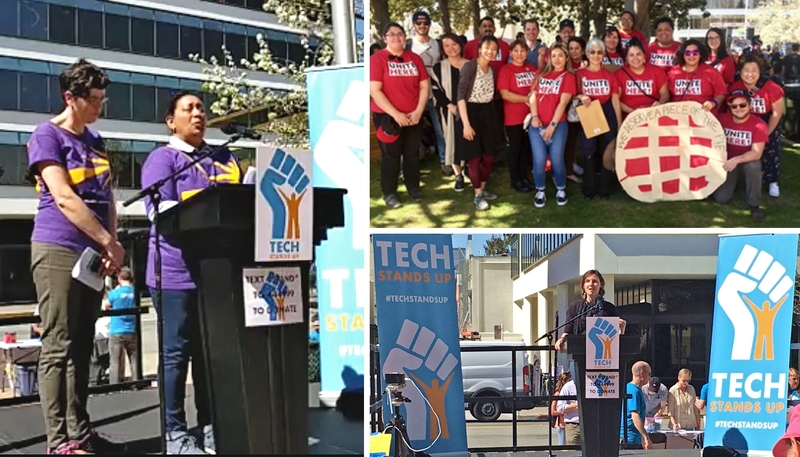 Speakers from across the tech industry urged workers to stand together to address issues of inclusion, sexual harassment, and poverty wages paid to contract service workers. It was incredible to see brave women like Maria Gonzalez, a janitor at Facebook, and Jacky Espinoza, a barista at Cisco, share their stories as immigrants and as contract service workers struggling to make ends meet. Despite the many threats we face as a community, this rally highlights the new opportunity for workers across the tech sector to push their companies to take a stand for our shared values. Check out coverage of the rally in USA Today, CNN, and Mic. These are the workers that make the most prosperous companies in the world possible, right here in Silicon Valley. As their workers face threats from deportation to displacement, it's time for tech companies to step up. Protect the rights of immigrant workers by adopting sanctuary workplace policies, and use all their political and legal resources to resist mass deportations. Fight hate and discrimination in public policy and build more inclusive workplaces. Address tech's impact on inequality through hiring responsible service contractors and investing in affordable housing solutions. Seeing high- and low-wage tech workers stand together is an exciting step in our campaign to grow an inclusive middle class in Silicon Valley. Join them by adding your name to the petition here. On Saturday, 3,000 security officers who protect the campuses of Facebook, Cisco, Genentech, and other tech campuses won union recognition with SEIU United Service Workers West. This is one of the largest private sector organizing victory in Silicon Valley history — and in recent memory in California. It's a win that was made possible because community, faith, and workers partnered with tech industry leaders to ensure a fair process for workers to choose a union. Apple and Google fired a low-road contractor and demanded their security firms stayed neutral as these workers organized. When we act together, we can inspire the tech sector to use their immense wealth and power for good. On Tuesday, the San Jose City Council voted unanimously to raise the city's minimum wage to $15 by 2019, three years before the state of California reaches that standard. San Jose — the 10th largest city in the nation and the capital of Silicon Valley — now joins five other Santa Clara County cities in acting on an unprecedented regional approach to jointly raise the wage. "Amidst the turmoil in Washington, Silicon Valley is leading the way with innovative policies that reduce inequality and support working families," said Derecka Mehrens, executive director of Working Partnerships USA, which co-leads the Silicon Valley Rising coalition. "This vote marks an important step in our regional approach to raise the floor and put money in the pockets of workers struggling to pay for rent and food." In response to public pressure from Silicon Valley Rising, community allies and elected officials leading on the issue, thirteen cities in Santa Clara County endorsed a plan in June to enact $15 minimum wages by 2019, three years before the State of California reaches that level. This is the first region-wide approach to raising the minimum wage in the nation. Cupertino, Los Altos, and Palo Alto have since voted for $15 by 2019, and Mountain View and Sunnyvale will get there even sooner in 2018. "If you work hard and play by the rules, you should earn enough to make ends meet," said Ben Field, executive officer of the South Bay Labor Council. "When one in three workers in Santa Clara County make too little to cover their basic needs, we can't get to $15 an hour fast enough." As the largest city in Santa Clara County, San Jose's vote adds momentum to the regional plan. If adopted by every city in the County, this groundbreaking wage standard would give raises to 250,000 workers, putting $800 million more in their pockets each year and boosting the gross domestic product of the nine-county area by $314 million every year, according to a report by the Institute for Research on Labor and Employment at the University of California, Berkeley. "I work two jobs, but with rent going up I can't make ends meet," said Yasmin Fernandez, a fast food and gas station worker who testified before the Council. "A $15 minimum wage will help me provide for my family." The Council voted 10-0 to raise the minimum wage to $12 on July 1, 2017; $13.50 on January 1, 2018; and $15 on January 1, 2019. After that future wage increases will be indexed to the inflation rate. The ordinance excludes youth in job training programs that last for 120 days or less. On the heels of votes in four states to raise their minimum wages (Arizona, Colorado, Maine and Washington), Silicon Valley's action to raise the wage shows that outside of Washington, DC, there is powerful momentum for policies that address both economic and racial inequality and strengthen workplace standards. At the state level, Props 55, 56, & 57 — which our California Calls coalition educated more than 600,000 voters on statewide — all received over 60% support. Yet nationally, we just saw a stunning upset for a politics that channels anxiety and frustration into fear and hatred. The coming years are going to be rough. We need to prepare for uphill battles to preserve the rights of immigrants and people of color, protect labor standards, and defend hard-won progressive victories. To do that, we need grassroots power. We need people committed to standing up against divisive rhetoric and dangerous proposals. We need the infrastructure of movement-building leaders and organizations to bring people together and develop smart policy. And we need to show the country a positive alternative to the darkness that shaped this election cycle. That's why our victories here matter so much. They show a path forward — a way to speak boldly and honestly about racial and economic injustices, engage underrepresented voters and pass policies that will make a real difference in the lives of our communities. They show that we know what we have to do, and that we can do it. We couldn't have won these measures without strong support from our partners and allies, a list far too long to thank here. As we move forward, we must continue to stand with each other, rising together for our communities. Working Partnerships USA was founded on the belief that building power on the ground forms the foundation for national change. That's where the USA in our name comes from. In this time of turmoil, that vision is more important than ever. The Valley Transportation Authority Board just took a groundbreaking vote that will open up career opportunities on over $4 billion in construction projects for local community members who are struggling to find good, family-supporting jobs. This victory has been nearly five years in the making. Working Partnerships is proud to have led this effort via our Construction Careers Initiative, a collaboration with the Santa Clara Building Trades Council, the South Bay Apprenticeship Coordinators Association, the South Bay Labor Council, affiliated construction unions and apprenticeship programs, and community partners. Through this initiative, the South Bay is building a pipeline into high-road construction jobs - one big step towards shrinking inequality and building an inclusive middle class. VTA joins the County of Santa Clara in adopting a "Community Workforce" policy covering its billions of dollars in construction projects. The policy expands access to career pathways through creating apprenticeship jobs for local low-income residents. The next step in making that commitment real is to expand the Community Workforce model, so that greater numbers of our local youth, veterans, women, low-wage workers and other under-represented residents have access to construction careers. 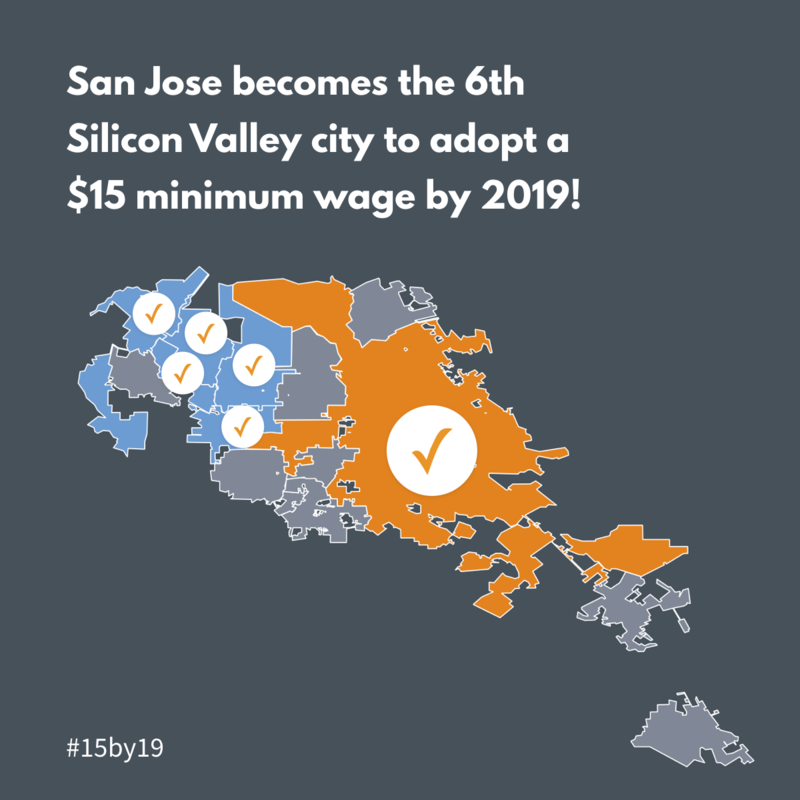 Last week, 15 cities in the heart of Silicon Valley voted overwhelmingly in favor of making a $15 minimum wage the region-wide policy by 2019, setting a timeline three years faster than the one set by the state. Though cities and states have taken action to raise minimum wages, Silicon Valley is the first to take a regional approach to setting such a standard. If adopted by each city council, this groundbreaking wage standard would give raises to 250,000 workers and boost the gross domestic product of the regional economy by $314 million every year. California passed a historic minimum wage increase to $15 by 2022, but for families in crisis in this high-cost region, we need to act sooner to raise wages, as well as increase hours for part-time workers and improve other job standards like paid leave. With one in three working households in Silicon Valley earning too little to cover even the most basic expenses, raising the minimum wage is a key component in moving working families into the middle class. The Cities Association's resolution will now come for a vote at each City Council in the region. Sunnyvale and Mountain View have passed ordinances for $15 minimum wages by 2018 and Palo Alto had already set a goal to achieve the same. Cupertino and Los Altos voted last month in support of a regional $15 minimum wage by 2019. And with 13 cities' representatives having voted for the resolution, the momentum is palpable. We'll be campaigning city by city to make $15 by 2019 the law of the land. In one of the most prosperous regions in the country, far too many working people are barely scraping by. Just released, our new report, A Hidden Crisis: Underemployment in Silicon Valley's Hourly Workforce, reveals an explosion of part-time work that helps drive the poverty that has persisted despite the economic boom. 77% of these workers are paid less than $15 an hour. 58% of their households are rent-burdened, paying more than 30 percent of their total household income for rent. 45% lack access to job-based health insurance. 25% are on Medi-Cal and 11% are on food stamps. This crisis of underemployment disproportionately affects women, who make up 63% of hourly part-time workers, and people of color, who comprise 69% of this workforce. The Opportunity to Work Initiative, the first of its kind, would require large employers here in the nation's tenth largest city to offer additional work hours to current qualified workers before hiring new staff to fill the need. With recent victories in the Fight for $15, the minimum wage is starting to catch up, but working people can't make it on $15 an hour if they aren't getting enough hours on the job. Policies regulating work schedules haven't kept up with the ways in which employers are restructuring employment and shrinking the work week. These trends exist in the broader context of corporations making work more and more insecure - not only through unstable schedules, but also through the use of subcontracting, temp work and Uberized "gigs," which are widespread in and catalyzed by the tech industry. This speaks to the core reason that communities, workers and faith came together to create Silicon Valley Rising, which launched the Opportunity to Work Initiative. Silicon Valley Rising is about working people rising up - to inspire industry to build an inclusive middle class in this region, and to organize for change through public policy and through a voice at work. We must unite the fight for fair wages, the fight for fair hours and all fights for better jobs to make Silicon Valley a national model for how the new economy can generate shared prosperity. A report released today by Working Partnerships USA and Silicon Valley Rising, and covered exclusively by The Washington Post, reveals that contract industry workers serving the tech industry receive much lower wages and are disproportionately Black and Latino compared to direct tech workers. This is significant, as the report notes, because in Silicon Valley, the number of jobs in potential contract industries has grown three times faster than overall Silicon Valley employment over the last two and half decades. "We knew the tech industry was booming, but we weren't seeing that translate into an abundance of jobs for our communities - until we looked at the low-wage jobs in contracting industries. Those are growing fast, just like tech profits are. It's no wonder that one in three working households in Silicon Valley can't make ends meet when these growing industries pay wages that barely cover rent," said Derecka Mehrens, Executive Director of Working Partnerships USA. The economic status of those indirectly employed by the tech industry is much worse than the directly employed tech workforce in both white- & blue-collar work. On average, direct tech employees earn $113,300, while white-collar and blue-collar workers in contract industries average $53,200 and $19,900, respectively, the report finds. Moreover, as earnings go down, the proportion of the workforce that is comprised of Black and Latino workers goes up. On average, African American and Latino workers make up just 10% of the directly employed tech workforce, approximately 26% of white-collar subcontracted industry workers and 58% of the blue-collar workforce in subcontracted industries. "This report shows that the rise in subcontracting has made the high tech sector a weak engine for middle class job creation," said Ben Field, Executive Officer of the South Bay AFL-CIO Labor Council. "Additionally, it shows that the few good jobs tech does create go disproportionately to white men." Click the blue button above to pledge a monthly or annual donation. Our campaign to create a cutting-edge standard for good jobs. While tech companies make massive profits, the workers who keep them running smoothly have been left behind. Silicon Valley Rising is here to fix that by raising wages, creating affordable housing, and growing our middle-class. We're building a tech economy that works for everyone. © 2018 wpusa.org, All rights reserved.